Sustainability was a key factor in ArgoGlobal’s move to an innovative new workspace in London. 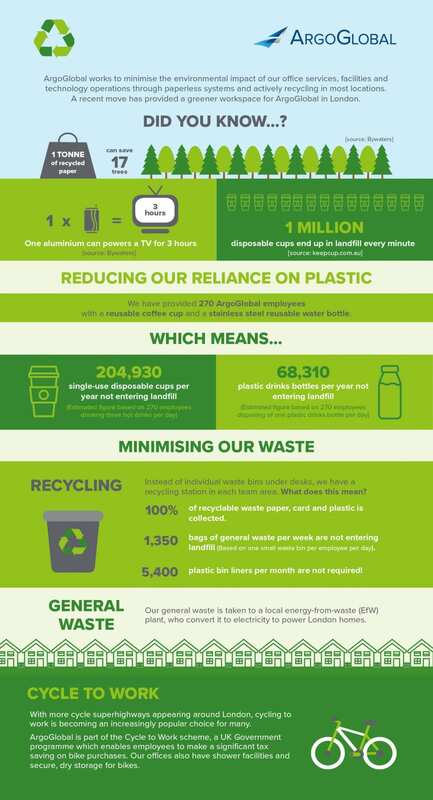 Here are some of the positive steps the ArgoGlobal London team is taking to reduce their impact on the environment. ArgoGlobal works to minimise the environmental impact of our office services, facilities and technology operations through paperless systems and actively recycling in most locations. A recent move has provided a greener workspace for ArgoGlobal in London. 1 TONNE of recycled paper can save 17 trees? We have provided 270 ArgoGlobal employees with a reusable coffee and a stainless steel reusable water bottle. 68,310 plastic drinks bottles per year not entering landfill (Estimated figure based on 270 employees disposing of one plastic drinks bottle per day). Instead of individual waste bins under desks, we have a recycling station in each team area. What does this mean? 100% of recyclable waste paper, card and plastic is collected. 1,350 bags of general waster per week are not entering landfill (Based on one small waste bin per employee per day). 5,400 plastic bin liners per month are not required! Our general waste is taken to a local energy-from-waster (EfW) plant, who convert it to electricity to power London homes. With more cycle superhighways appearing around London, cycling to work is becoming an increasingly popular choice for many. ArgoGlobal is part of the Cycle to Work scheme, a UK Government programme which enables employees to make a significant tax saving on bike purchases. Our offices also have shower facilities and secure, dry storage for bikes. 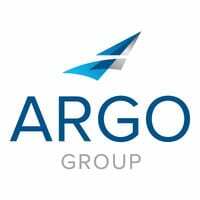 Learn more about Argo Group’s commitment to sustainability at argolimited.com/about/corporateresponsiblity.